Click the map to see more information. This trial consisted of Easyboot Epics on the fronts and Easyboot Bares on the hinds. Tanna and I were joined by Angie and Khasey for a Christmas Eve day training ride. We pretty much had the trails to ourselves for most of the day. We did see a couple of other small groups out, but it was very nice to be able to have the trails to ourselves. Percy Warner Park is a very popular horse trail system and we expected to see more riders, but I guess others had family obligations. Anyway, on to the trial. I went out at 7 AM to get Tanna's boots on. At 7:50, I had all 4 boots on with vet wrap. About the timing I was expecting. I was pleased, though, to be able to get both front Epics on in 10 minutes! I lunged Tanna for a few minutes to watch him move in the boots. He did pretty well. He smacked the bottoms of the fronts a few times, but seemed to do ok. I turned him back in the paddock to wait until time to leave for the park. We did 17 miles in 3 hours. Tanna moved a lot better this trip! He still wanted to go crooked occasionally, but it was much less and he straightened up when I asked him to. All boots stayed firmly on his feet and when I removed the boots, I saw no signs of rubbing or soreness on any of the four feet. The Bares came off a lot easier than I thought they would. I put the heel of my hand on the boot ledge to the outside of the hoof and shoved hard. The boots just popped right off. I think they might have loosened up with the riding. I'll tighten them up one hole before my next ride. I still think I might rasp the fronts of the Epics to try to speed up the breakover of the fronts and make it easier for Tanna to keep his feet out of the way. I also want to try using the boots without vet wrap. It would make it easier (and cheaper) to use the boots if I didn't have to wrap the pasterns all the time. Photos and descriptions on Flickr. Merry Christmas to all and to all I wish horsey kisses. # Improved instantaneous pace reading to be smoother and more accurate. # Improved high pace, low pace, workout step complete, time alert, and distance alert beeps. # Added feature to preview course map and course profile on the unit. # Improved Auto Scroll to allow fast, medium, and slow speed scrolling. # Added support for foot pod accessory (not yet available). # Added quick selection of indoor mode (GPS off) by pressing and holding the mode button. # Fixed problem with repeatedly reporting On Course and Off Course on some Course tracks. # Fixed problem where track log would not display in history if the timer was started without a GPS fix. # Fixed problem where today's scheduled workouts would not display if the local date was different than the UTC date. I loaded this onto my unit for my ride this afternoon. So I guess I was testing two things: the Epics and the new firmware! I did an Advanced Workout using the new auto scroll feature that I really missed from my Forerunner 301. Everything worked great! I don't know about other parts of the country, but I often find myself printing out PDF entries, filling them out by hand, and mailing them to the ride manager or secretary. This does get tedious after awhile, not to mention my handwriting can get somewhat animated and hard to read, especially when I'm in a hurry. The answer? A PDF Editor. I use PDFill to load in the PDF file and type in all my information. Then I save, print, sign, and mail. This makes it a lot easier and quicker to send legible ride entries. I was looking through some old pictures and found this one of Tanna and me taken back in February 2001. This was my trial ride on him. 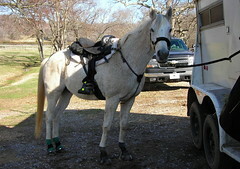 He was owned by Dee, a friend who mostly rode gaited horses. Tanna was her only "trotter" so she was looking for a home for him to reduce her herd. In February, at Dee's urging, Daniel and I went to do a trial ride, despite us not having the money to buy a horse, much less take care of one. 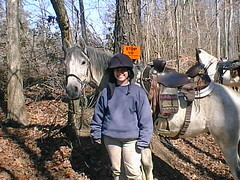 I enjoyed riding Tanna immediately and liked the fact that I could place him on the trail anywhere I wanted. He has a very sweet, little-boy, in-your-pocket personality that was very attractive. In March, I accepted a position and as soon as I hung up with the head hunter, I called Dee and told her I wanted Tanna. 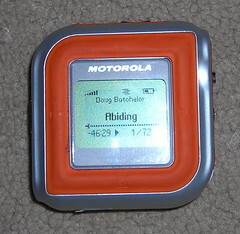 On long endurance and training rides by myself, I amuse myself by listening to my Motorola m25 mp3 player. This player is great. It will play WMA (including the protected DRM ones) and MP3. It has bookmarks, so I can find my place again if I'm listening to a sermon or an audio book. It will play playlists or all by artist, genre, album, etc. I can even listen to the radio. Sometimes the reception isn't so nice, but it's a change from mp3s. The m25 also has a Secure Digital (SD) card slot for extra memory. 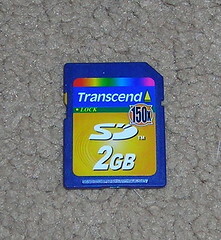 Recently, I bought a 2 GB SD card for my digital camera and was pleased to find that this card will work in my m25! I loaded 72 Doug Batchelor sermons onto the card to test the m25. This is about 1.6 GB worth. As you can see, the m25 sees all 72. You can download Doug Batchelor WMA files for free from the Amazing Facts web site. When away from my computer and electricity, I still need to charge my Forerunner 305 battery so that it will work on my endurance rides. Sometimes this means I have to charge during a ride between loops. I use a USB battery extender. Basically, it's a box that hold 4 AA batteries and the other end is a USB "port." You can plug your normal mini USB cable into this and charge almost anything. I use one to charge my Forerunner 305 and have used it on my Foreunner 301 as well, and my blackberry. So just about anything will work. I also have a 12 volt USB converter. It plugs into the cigarette lighter in my truck and then I can plug my USB cable into that and get it to charge this way, too. I've done that quite a lot, too. Go to eBay and do a search on "shuffle battery extender". You can find these for about $10-$12 shipped. They're marketed for the Apple IPOD Shuffle and are white. They work great. Make sure they can plug a USB cable (or an IPOD Shuffle) directly into them. I use mine at my camp and make sure it's in my vet check bag for away checks.